K-220 The "NEW" Inflatable Standup Paddleboard (iSUP) super pump. Because we listened to you we've developed a "taller" version of the K-20 model with all the same great qualities. You'll find it is faster and easier on your back. If you have a "larger" ISUP or just have to be on your board ASAP, the K-220 was created for you. It weighs in at around 3 lbs. and is 33 inches "tall". This enables you to stand more upright when filling you board. And yes! Because it's "taller" it delivers about 40% more air volume per stroke in both stages. 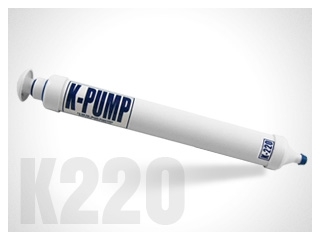 We need to restate the same words of caution we offered with the K-20 model: "Because this pump is so easy to stroke, be sure to check your p.s.i. frequently."